A state-of-the-art headset which Samsung first launched last November, Gear VR offers an immersive and interactive virtual reality experience through a wide range of exciting mobile content, that include games, movies, apps, 360 videos and 360 photos, among others. Touted as the best portable VR device in the market today, the Gear VR will soon be available to Smart Postpaid subscribers on select Samsung Plans through convenient payment options. “We are excited to bring the Gear VR soon in the Philippines as a welcome addition to our suite of meaningful and innovative products that enable subscribers to unlock the full power of their devices” said Ariel P. Fermin, Executive Vice President and Consumer Business Head at PLDT and Smart. “The virtual reality platform is the future of mobile entertainment, and through the Gear VR our beloved subscribers will be able to peek into that future and boost their mobile entertainment experience anytime and anywhere they want,” Fermin added. The Gear VR is seamlessly compatible with the latest Samsung Galaxy phones – namely the S6, S6 edge, S6 edge+ and Note 5. The device uses the handset as its processor, and displays content through a Super AMOLED screen. By simply slipping in any compatible Samsung smartphone in front of the Gear VR lens, users can instantly transport themselves in 3D and CG animated worlds, as well as 180 or 360-degree live action scenes. The portable device features a touchpad, back key, volume key and focus adjustment wheel, as well as a gyro, accelerometer and proximity sensors for a complete out-of-this-world experience. The Gear VR comes with pre-loaded trailers and videos, with more exciting apps and content available at the Oculus Store. Users can have loads of fun solving third-person adventure games such as Herobound: Spirit Champion and Adventure Time, or unlocking mysteries and exploring pathways with Land’s End. Shooter game fans will also have a blast with Viral, Smash Hit and Eve: Gunjack, which take users at center of the action with stunning graphics. Users can also enjoy apps like Oculus Video and Netflix, which allow them to enjoy a virtual private theater set-up while watching their favorite films and series. With the Oculus Social app, Gear VR users from all over the world can hang out in a virtual movie theater while watching videos on Vimeo and Twitch. “Smart subscribers are always the first to experience the latest in mobile innovations. This is part of our long-standing campaign for more Filipinos to embrace the Smart Life, enriched by our unparalleled breadth of digital content and backed by the country’s most extensive network,” said Fermin. 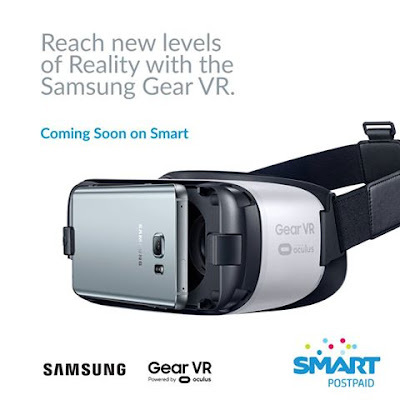 Stay tuned to know when the Gear VR will be available at Smart by following its official accounts on Facebook (www.facebook.com/SmartCommunications), Twitter and Instagram (@LiveSmart).